A good number of users loved the comfort that the Adidas Predator Tango 18+ Trainers football boot provide. Many of its buyers liked how the upper of these laceless boots hugs the foot. Majority of the users commended the style, as well as the versatility of these Adidas football shoes. The convenience of not having to lace up the Adidas Predator Tango 18+ Trainer has been praised by many users. Many users like the bottom boost of this football boot which is partially covered by a plastic outsole keeping the shoe clean. A specific user complained about having his pinky toes being swollen while wearing the Adidas Predator Tango 18+ Trainers. These Predator football boots are too narrow said some reviewers. 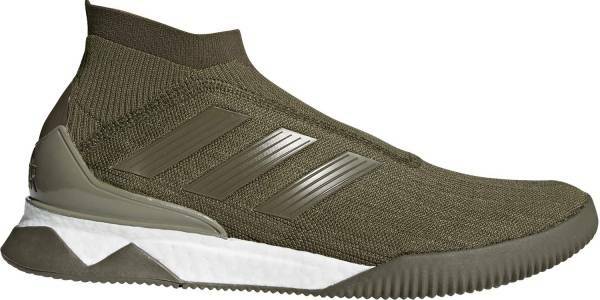 A notable number of observers commented on the poor quality of the Adidas Predator Tango 18+ Trainer specifically the glue stains and the stitching on the logo. Most of the users suggested getting a half size smaller to get the best fit. A certain player noted that the Predator Tango 18+ Trainers could have been more comfortable with an insole. The Adidas Predator Tango 18+ Trainers leads the 2018 Predator collection as it comes out in a sleek laceless design that is loved by wearers. Among this football boot’s good points are its versatile design and comfortable fit. Many also liked the convenience of not having to lace up the boots. However, a notable number of reviewers complained about the football boot being too narrow. Still, this football boot is another good option for those who are looking for a multipurpose shoe. On feet, these are unsurprisingly very very comfortable. The boost midsole of this shoe really reminds me a lot of the NMD. So you have a significant amount of boost on the heel where I think it has the most bouncy feel to it. Whereas the forefoot to box area is still cushioned but is defiitely a lot more low profile and thinner in general. Influenced by many of its counterparts including the Adidas Predator Tango 18.1 Firm Ground version, the Adidas Predator Tango 18+ Trainers is perfected to rule both the pitch and the street. Apart from its classy colorways, it also carries unique features that made it different from other trainers. These trainers feature a laceless design that is also seen on its firm ground flagship, the Predator 18+ Firm Ground and works to give ease and convenience to wearers. Its Primeknit textile upper provides ultralight comfort and adaptive support. This upper mimics the shape of the foot to lock it down and prevent slipping. These characteristics primarily are the reasons why the boot eliminates the need for laces. Another feature that this football boot boasts is its responsive boost midsole. It provides maximum in-shoe comfort and charges each step to keep the user on top of every situation. To provide excellent traction on both the pitch and the street, Adidas built this shoe with rubber outsole. It does not only prevent the wearer from slipping, it also supports the heel of the foot. Wearers can expect a snug fit and a sock-like experience from the Adidas Predator Tango 18+ Trainers because of its one-piece construction. This football boot comes in standard sizes for men, and it fits true to size. A non-marking, rubber outsole lines the base of the Predator Tango 18+ Trainers. This sole unit efficiently provides stability alongside delivering reliable traction on hard street surfaces. This football boot employs the Boost midsole. This technology works to give energy with every step as well as ensure a comfortable experience for the wearer. The upper of the Adidas Predator Tango 18+ Trainers wear an anatomically designed Primeknit textile that wraps around the foot. It mimics the shape of the foot and provides excellent fit and support without the need for laces. This will aid in better ball control and handling. The super lightweight Primeknit textile also offers breathable comfort. Meanwhile, the Sockfit collar offers enough stretch to promote stability as well as ankle mobility. The Adidas Predator Tango 18+ Trainers in the Skystalker Pack feature a primary black tint accented with red details. This collection took inspiration from the deadly predators of the animal kingdom. The Cold-Blooded Pack gives a new look to the classic red and white shoe. The Predator Tango 18+ Trainers in the Cold-Blooded Pack sport dominant white upper with a Real Coral accent around the sole. Meant to give a primal vibe, the Adidas Predator Tango 18+ Tango in the Deadly Strike Pack is inspired by the most lethal predators in the wild. It combines the colors of nature with a deadly design to complement those lethal moves on the pitch. This football boot weighs 294 grams.